President Trump, in a meeting with congressional leaders, resurrected a false claim that has been repeatedly debunked. Trump’s fixation with this apparently started with a few tweets by Gregg Phillips, a self-described conservative voter fraud specialist, who started making claims even before data on voter history was actually available in most jurisdictions. (It had not even been determined which provisional ballots were valid and would be counted.) These claims were then picked up by such purveyors of false facts as Infowars.com, a conspiracy-minded website, even though Phillips declined to provide any evidence to back it up. After Trump’s tweet, the Trump transition team then scrambled to come up with proof, but could only resurrect claims and data that had been previously rejected as irrelevant during the campaign. None of the information supported Trump’s claim of “millions” of illegal votes, just isolated instances of voting irregularities. 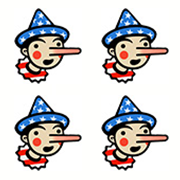 Both Trump’s claim and the Trump team’s effort to justify it earned Four Pinocchios. As of December, just four documented cases of voter fraud have been identified. Our colleague Philip Bump calculated that voter fraud amounted to 0.000002 percent of the ballots cast in the race for the White House — if they counted, which they don’t. The Fact Checker Recidivism Watch tracks politicians who repeat claims that we have previously found to be incorrect or false. These posts are short summaries of previous findings, with links to the original fact-check. We welcome reader suggestions.